Finally I have finished wrestling with the frustration of re-creating the promotional video, and also pinnacle 12. This time I took copies of the project as I did each significant piece. Still it worked fine this time. I hope you like this video. It is a bit of a departure from my normal game promotional videos. This time however I was inspired to be more creative and less amusing with my take. The most startling thing about this video to me though... is my accent. Yes that is me doing the voice over. I got exactly what I wanted.. and on the first take. whoop... Only 'Is that really my accent?'. Not always so English now it seems. I have been asked now again about what software I use to develop my games with. As I think the list is rather longer than I ever expect I figured I would start tonight by writing some on the list tonight. Whilst I try and re-create the Heroic Patterns Promo video. 1. NCH Software Wavepad. This is my go to SFX editor. It is so like most other good ones except it doesn't mess around. It is smartly programmed and works naturally, doing what you expect when you try it's features. 2. NCH software MixPad. This is a multi-channel sound editor. Allowing me to easily overlay various sound effects and music and get the whole lot balanced and sounding right. Then I can simply save it out mixed together, lovely. Again a sharply developed App. 3. Pinnacle Studio 12. This is a poorly programmed piece of software in my opinion, only it is excellently designed and I love that about it. It is my go to movie maker as I can knock stuff out so incredibly fast. But some of the bugs are so annoying and have been around since pinnacle verison2 or so. 4. Prism by NCH Software. This is my sound and music converter. It doesn't simply convert from one format to another. It also allows me to alter quality and pixel resolution of the movie. Great for spot movies on tablets etc. I think that list about covers my audio and movie editing set of software. I am not sure what list to make next... I'll think about it. Ya know, I love the way Pinnacle works. A single timeline etc and most of it's functions are easy and intuitive to use. But in parts it is simply a piece of crap. Namely it's stability. I was working hard to get my Heroic Patterns promo video out tonight. It was mostly ready and simply needed a few higher rez screenshots and some tweaking with the transitions to make it about perfect. Today I managed to reveal the current state of it to me mates to see what they thought. Still tonight however much I would like to finish it, I cannot. It is so frustrating and now it will be done some time over the weekend no doubt. I still have all the parts and I have the render I showed me mates to work from to get back some of the timing. This is a development video of the background effects I created for Heroic Simon. I love the way they turned out. I knew this day was coming. I knew weeks ago. But dealing with it has just not happened. I should be truly happy. Both versions of Heroic Patterns has passed Apples review, first time. Only now it means I have to publish the games, which means I am now back to putting out the games and trying at least a little to back them up. This means modified web pages on www.sorcerygames.com and doing the promotional video that I have STILL not gotten done, gah! This should not make me frustrated, yet it is the way I feel. Heck, I have Heroic Simon done as well. As of today when I achieved the last achievements and final testing was completed, the game could easily go to Apple to review as well. Eeek, I am so behind. Not quite sure what to do right now, I think get the darned promotional video done is my priority, everything else just might fall into place after eh? Surely? Games supporting themselves? You Jest! I have been playing Marvel Avengers Alliance on Playdom.com now for quite some time. I really enjoy the game, even if it does have it's issues. Today they announced that the game was going to be closed down in a month. I have to say I am not really surprised by this announcement. It was only a few weeks ago that Disney who owns Playdom announced they were laying off 700 employees. A number of them had to go from Playdom for sure. What it also means is that Playdom MUST look at it's costs on its games and save money. Or put another way, focus on the more viable content and games they have. Lets look at this for a minute..
on Facebook I did a few PVP seasons and could see that they had 800K to 1.2M players.. WOW! on Playdom I could see with the same method there were barely 35K players. I seems to me that supporting maybe 40K players (some did not play PVP) was simply not viable, unless the Playdom players spent a LOT of money on Gold etc. I do not believe the Playdom players did this as they have a low tolerance for what they called Wallet Warriors, never apparently realizing that these WW players were the ones keeping the game going. Playing for free (ad supported play) was never going to support an entire development team. I really enjoy the game. Yes some of the quality could be lacking, and some of the decisions on balancing were atrocious, but it is good. I like spending time there. Also some of the other players (not the moaners!) are great to chat with. I shall miss them. Posted by VoodooChief at 10:51 PM 0 comments Games supporting themselves? You Jest! I am very lucky to call a guy named Chris a good friend. We have been in this industry now for many many years. 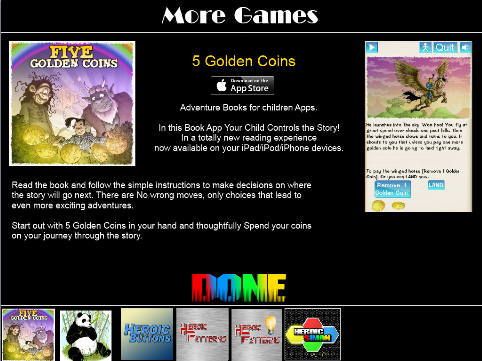 He is a talented guy that recently finished up his first Marmalade created game for tablets. Today I received an informational email from marmalade and I see his app is featured. Here is a copy from the email I got. As you can see is game is the bottom right one.. WOOHOO! Congratulations mate, it is a fantastic game that hopefully will do well. Here is a link to the official Marmalade promotional site. Mythic Mahjong iOS. Here is the facebook page link... Facebook Mythic Mahjong. I hope everyone loves this game as much as me and my wife do. Now go get yours!!!! I am very excited to see what Chris can produce as his next finished game. I cannot get away from them haha. My new queuing system works great. So when a game ends I can add as many leaderboards updates as I want. So I realized today that I should add another. Yup, you heard me right. So off I went tonight and added another one, this one records the best rounds reached in each difficulty. Next up will be to do some achievements for the game. this time I want to create slightly more interesting ones than in the last two distilled games I did. Simply basing them all on score is a tad boring if ya ask me. I will be thinking about these over the next few days. So what's left for Heroic Simon? 5. Work on the web site for pre-release. Not a lot to do eh! Yes, the game is very close to being complete. Meanwhile Apple is testing Heroic Patterns the paid version. 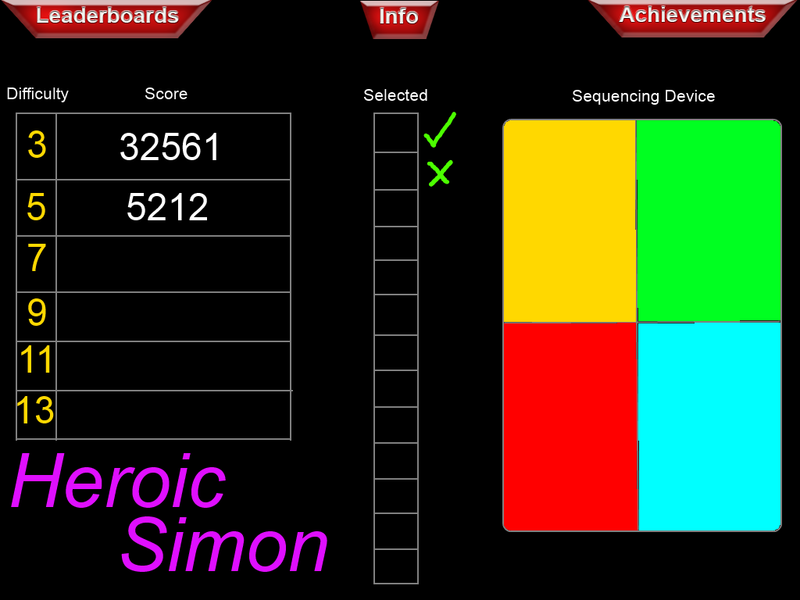 The only complaint I have right now is that I asked Apple to reset my leaderboards for Heroic Simon, and the web page says it will be done in a day.. but it is still not zero'd out. Not sure who I should complain to about it either, gah! I need them reset, as I have a score incorrectly placed into the number of games played. In my previous post of course I mentioned that I needed 18 leaderboards. In fact that was a mistake, I only needed 12, as to of those types I imagined as different, were in fact the exact same information. Namely I thought personal best score per difficulty and best score per difficulty were different. Of course now I know they are the same thing, I realized once I actually called the leaderboard code to upload the values, and I was uploading the same value for both. DOH! I didn't want to delete the leaderboards I have setup already. So I have come up with another idea to use them for. so I went back to iTunes connect and very quickly rewrote the descriptions. So now I have some new leaderboards to play with. ok, so setting up the App itself was not time consuming. The main app setup went quite well as I placed a bunch of placeholder pictures and information into it. The only thing I really had to do was add more to the description, as apparently there is a minimum requirement for the description of ten words. Simple to just type in a sentence of waffle haha! That means setting up 18 leaderboards. Now it is not very difficult to set up a leaderboard on iTunes Connect. Apple have done a wonderful job of that. Only they appear to have missed out the clone or duplicate existing leaderboard button. If I had this button I could make the first one and then simply clone another 17. Then I could go and make the slight alteration to the names. What I don't understand is why Apple don't have this feature. You know, clone how many times and increment the name would be easy enough to implement, and Who just has a couple of leaderboards in their games? I would expect the number of them I am using to be quite small. In the end I feel that apple could improve this area of their App seup, and then they can do the same thing to the Achievements setup. Laters, gotta go setup the leaderboards in game now they have had time to spawn across the internet.. or applenet. I don't know why, but I really dislike having to create a new app in iTunes connect. I simply want to setup my App by name, then add what I need to when I have them. Instead I have to setup a bunch of stuff right away, though I can them come in later and add or alter the assets. I am just not sure why I need to have so much ready at the beginning. Now a friend told me I do not have too. In fact he said that I can upload any images, and who cares if they are blank images. also he mentioned that you don't really need copy, just a sentence or two. ps. I have now uploaded Heroic Patterns (non ad paid version) to apple for test. I enjoy putting in sfx for my games. Recenttly I have not had to do that for Heroic Patterns, as I did not feel I could do the game justice with my Sfx library. they would have had to have been more custom and maybe dynamic. 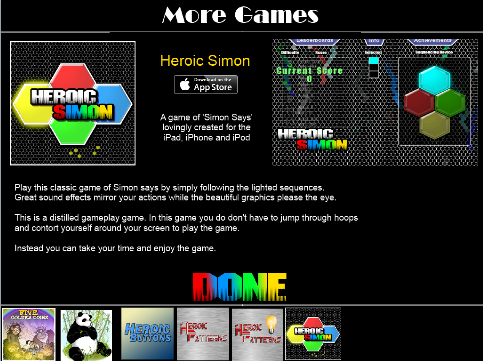 So here I am working on Heroic Simon and it is the perfect game for adding in some Sfx to enhance the gameplay. Not just enhance, but also help people distinguish more easily what is going on. It has taken me well over an hour to find and grab the Sfx I need for the game (A list I made at lunch time). Then maybe another 30 minutes or so to process all these Sfx for the game. Processing the Sfx includes adding echo or other effects if needed, and then normalizing them to the correct volume. Tonight I have also spent about 60 minutes on getting them into the game. Although they all appear to be playing now (after an awkward start), but not really playing at the right times. For example the two result Sfx, correct & wrong, both play when you got a match, but neither play when you didn't. I am so tired now tonight that I will have to come back to this tomorrow. I am expecting another hour and the Sfx will all be in and working satisfactorily. At 11:27am this morning I got an email telling me that Apple had placed Heroic Patterns Lite 'in review'. At 2:39pm this afternoon my next email told me that the game was 'in processing for the App store'. Woohoo, it passed first time! At 4:09pm I received another email telling the game was ready 'Ready for Sale'. I think it has been a good day. Now I need to go and grab the Ad free version and get that passed. Once that is ready for sale, I will release the games at the same time. 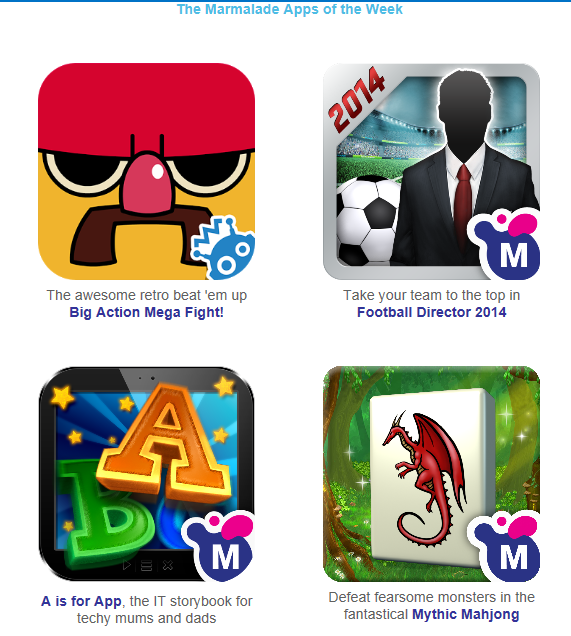 A truly busy day at work today, but a pleasure to see this progression with my latest App. Finally I am over the hump I wrote about previously. to do this I simply chose what would be the easiest option (or very close to it). This has enabled me to move on with the rest of the game code and I am now once again making headway on the game. I have to say that although I have chosen the easiest way out, it is not looking too bad. Though I will have to change the method I am using to bring on the information test (instruction/prompts). Even my daughter doesn't like the way I scroll them in from the right side. I also started to add in the score today, though I do not have a scoring method hooked up as of now. So everything is zero.. haha! I also need to go and setup my leaderboards on Apples connect, but that will have to wait a bit till I get some form of scoring in I think. More tomorrow for sure, I feel like I am on a roll again. It really is a simple blockage in my creative side. All I need is to design this simple item and Whammo I can write the code to make it all happen, and then follow that with the rest of the games code. Alas I have hit a blockage this weekend. A Simple thing, where all I need is to design how I will help instruct the player about the current mode of the game. This is a new thing and not part of my original design. In the original design the player would be guided around the various modes the game is in by simply lighting up the active section and low-lighting the inactive sections. I felt that would be great an work well. There are various reason why this is now not enough, and one of the main reasons is the wonderful background and it's activity, is simply distracting from this original design. So what to do now? Well put something up that tells the player what is going on. The thing is the game layout is not designed with a message in mind. So instead I will have to make something up that fits well enough and doesn't look entirely stupid. So annoying. Great word that one. Love it, and cannot get enough of it. In this case I was collaborating today with my artist friend. I finally got a version of the game up and running on the iPad and this allowed us today to go over the very few changes that I wanted. As it happens the version of the game I got to the iPad is a version with no gameplay at all. It really is the games graphics laid out properly. That way if the artist wants to move stuff around, then this is a good time, before I write any code that could possible care about such things. though of course I try hard to make my code not reliant on fixed positions of anything. I love defines and tables of positions etc. So this version had all the graphics in it, but also it had flashing input buttons to show just how good they will look. That will give me even more to collaborate with my artist on. While I am patiently awaiting Apple to test Heroic Patterns Lite. I am not standing still... Ok, I am sitting still instead haha. Working on Heroic Simon. The artist came up with a great look using Hexagons all over the place and covering the background of the game. 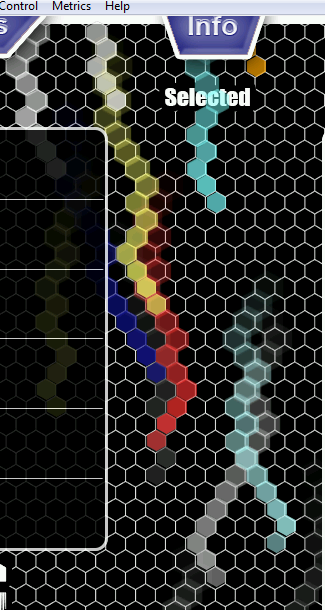 So from this we came up with an animation that looks like rain, only it is raining hexagons instead. Today I got that effect going and then added an effect trail and also colored the rain. Man, am I happy with the way it looks so far. I hope the artist will be happy as well. Now as it happens I tried to video this effect using Fraps. Somehow, or for some reason Fraps no longer captures the simulator properly, instead every other frame is bright yellow, most odd. So unfortunately I do not have a video for ya to look over. though I did want to mention something about this 'rain'. It falls down the screen and can fall either left or right to the next adjacent and lower hexagon. So I did this randomly and at the moment I am wondering if I should some form of AI to keep these rain droplets straighter down the screen. It is quite possible for them to make the same choice 20 times in a row and I watch the droplet slide off to the side, though it doesn't look bad, I am not sure if this is what I want. The above image shows my colored rain droplets heading down the screen. I hope people like them, I think they have a nice look to them. Although I still suffer from Bronchitis I am on the mend, just slowly. Yesterday of course I uploaded Heroic Patterns Lite version to apple for them to approve. Once that is passed I will get the paid version up and tested. I already set it up with no ads and it's own mobile provisioning files etc. So now it simply needs to be uploaded. However I won't do that until the Lite version is passed, cos it would be stupid to submit them both and maybe get the same bug for them both reported back. Ok, it's cos I am a bit lazy haha! Next up though is my Heroic Simon. I already have some mock graphics from my artist friend and once I get setup properly I will create a version of the game for the iPad so he can see his graphics in use. Then after that I will get to write the game. As you can tell, even though I am not truly q00%, I am getting things moving again. And on that note I am also working on the design for the title after Heroic Simon, though I have no real name, I have a couple of nicknames like, RoboZilla and Robo walker. So back to being busy, and I am also working on the redesign of my kitchen. Labels: heroic patterns simon buttons busy unwell robo walker. I have had Heroic Patterns Lite ready now for several days. Though I have been worrying over the game description that goes with the game rather more than I would like too. In fact what I have is pretty crap, but in the absence of anyone doing it for me, I will simply have to go with what I have created. I am not the fondest of working with Macs, not that they are bad, only I am not experienced at all with them.. I mean virtually nothing in all these years of working on games and computers. So when I think about connecting up my Mac cube and finding the program to run to upload a new game binary I can procrastinate really easily. This is what has happened these last several days. Well today was the day I decided I was gonna face my Mac. As it happens I had already left it connected up to one of my desktop computers monitors, so all I had to do was turn the thing on and grab the mouse and keyboard. When the machine booted up I looked at the screen in a confused manner (you know, head cocked to one side) because it had a window already on the screen and it was for the uploading of a binary. Whhahhh? I thought. This is what I needed to find. Well lets see if it works. 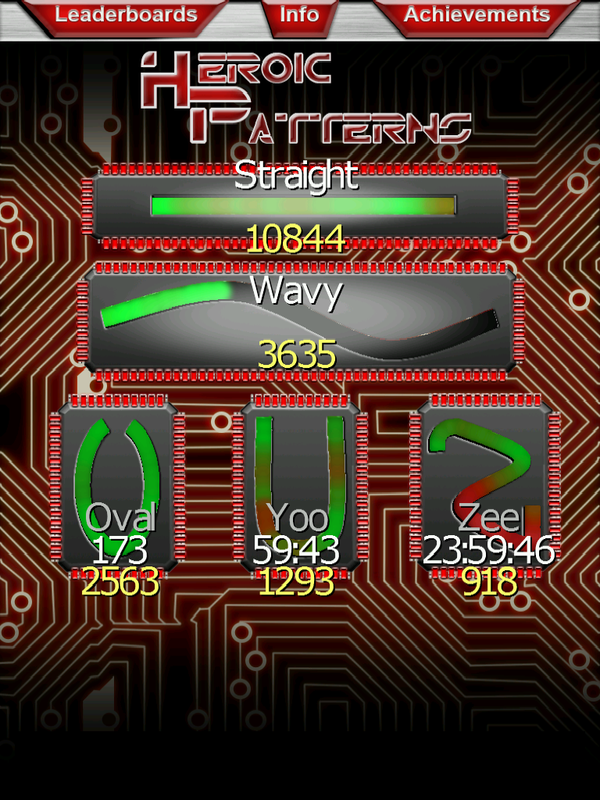 I clicked a few buttons and selected the only game available for upload, Heroic Patterns Lite. Then selected the file I had created and placed into dropbox. Then whammo it was on it's way. I would say 5 minutes after booting up the Mac I was done. the binary had gone and was awaiting review and so I researched and setup the mouse curser movement speed (it was way too slow). So I learn't something useful as well about Macs :) Good eh! So now Heroic Patterns Lite is in Apples review hands. I hope it goes through smoothly, but one can never tell. Most importantly I want the name to reflect the gameplay inside it. Especially for Distilled games, as that is part of being distilled after all. However with my new game Heroic Simon there is definitely a thought or two that this will be bad for me from a copyright standpoint. From what I can discern 'Simon' by itself is a registered trademark for the game/device. So I think I am safe. A trick I tend to use to find out if I can get away with a game name is to research what games are currently out there with a similar name. There are several examples of simon this or this Simon etc on the App store, so once again this helps me not worry too much. I also believe in a backup plan though. Mine is going to be that if I get a cease and desist order and it looks legit, then I will argue my case, and if in the end I must change my games name, then I will get the logo altered to include the small word of 'says' inside it, and rename the game to Heroic Simon Says. Pretty simple really. But I always like a plan. Posted by VoodooChief at 5:02 PM 0 comments Whats in a name? Although I have to bring my current games up to the 7.0 apple SDK standard (which means the Marmalade 7.1 SDK), I have decided after much designing which game will complete my series of three distilled games. It was a tough choice and I had 7 designs going into this last phase, only one could be chosen. Here below is my mockup of the screen. this is what I gave to the artist who will be working on this game. As you can see, this is my mockup, and the one that the artist will use to create something spectacular, something I am not capable of. We did discuss some ideas of how we could make this look not only interesting, but also make it alive, something I did in both the other distilled games. But first I need to upgrade Heroic Buttons and Heroic Patterns, and then get Heroic Patterns through Apple testing. My first thought is that the game did not do as well as I had hoped. I really think my facebook friends helped me out a bunch and downloaded the game. Which I think is fantastic. However anyone can easily see from the number downloaded that apart from my direct connections I never managed to get many people to download the game. That is a disappointment. It means several things. 2. No anticipation of release. 3. Marketing copy/Game description is not working. Now I think that number 1 and 2 are fairly obvious, and simply need more time and effort by me to make them better. But lets look at number 3 in a bit more detail. This is a very important one, as it will impact both of the other two reasons. My copy was a straight forward push to attract attention in a non sensational way. OK, so I tried for sensational and came up way short of that. I really think the copy should be challenging and confrontational.. Only I was not able to write that and get those ideas to come across. I tried a few times and it was always wishy washy. Now if only me mate Paul had written it, I would bet it would be sensational and confrontational etc.. When I release the next update I will try hard to get a better copy and I will look forward to seeing how that will effect my downloads. I still believe that a lot of people will have seen my game and simply passed it up as it didn't come across as interesting enough to download. Ok, that's it for tonight. I need to finish up some more work on my Heroic Simon design. I figured that today was time. Time to show and tell about the indicators for the sales of the game. 1. Silly promotional video on youtube. Viewed 19 times in 9 days. 2. Silly promotional video on vimeo. Viewed 24 times in 10 days. 3. GameCenter Leaerboards. 44 people on the leaderboard after 9 days. You know I was really disappointed with the 44 people in the leaderboard. I dreamed of a hundred after the first day. I had visions of a thousand after a week. The reality is much more humble. This is after all a game made for Leaderboards, virtually wholly made for them. As for the video views, I am of a mixed mind. If there had been more video views than downloads, then I would be upset that the video did not attract people to download the game. In this instance though I feel that people who viewed the video probably checked out the game. I have been watching these indicators all week, and I did not go near the real download data on iTunes.Connect until today. 116 downloads, and 90 of them in the first 2 days. No longevity of advertisement, of notifying the downloading public that my game is now live and out there. I will follow this post up another time with thoughts on this, only I wanted to keep this more informative than theoretical. I realized a few days ago I hadn't setup my other half of the Heroic Buttons game. By this I mean that I need to create an Ad free version that I charge money for. This has several main effects for me. 1. I get money for bought versions of the game. 2. I now get double the exposure for the game. 3. Prospective players can now see that getting the free version has some value. (compared to paid version). After realizing this I decided I needed to make sure I can share the leaderboards and the achievements between the games, as they are quite separate games within iTunes. After looking into the iTunes.connect manage apps area it was easy to spot there is a way to setup the leaderboards etc as a group so the can be used by more than one game. BRILLIANT I thought. Let's do it. This is where I had a problem. Maybe YOU have experienced this and have an answer to my predicament. My issue is that it informs me that it will convert my leaderboards into a group leaderboard, and that I should use the grp.Name to reference them. I don't know how I can do this without breaking the game I have in release now. Also if I create a new version I will have issues as that won't work properly until I change the leaderboard references. Bah! So I am stuck, and not sure what to do about this right now. Downloaded Heroic Buttons for iOS yet? I will be doing a progress report on whats happening with the game possibly on Wednesday, though Thursday would be a better day to choose as then the game will be out a week. That will give probably more balanced information. So far all my indicators are very disappointment. Posted by VoodooChief at 9:18 PM 0 comments Downloaded Heroic Buttons for iOS yet? Today was the day I was going to start posting my game description to forums and iOS fan pages. It started badly with me forgetting what my passwords are for a few of the excellent sites I had researched. Still how hard can it be to retrieve them? Not too bad, but still more time consuming than I wanted. Then I had real difficulty trying to figure out one of the sites (www.toucharcade.com) handled new release posts, I saw several of them all nicely formatted. a bit of research tonight showed me how it is all done with some nice tags they have for posting such information. Still I struggled to get my ID setup correctly.. I have no idea why I suffered to be honest. Then I got the iFans post setup. This gets posted to a holding thread tank before someone in authority places it into the correct forum. Not a bad system if it is being monitored in a timely fashion. It is a nice site though that seems to help a lot of people with their questions. I hope my receives some notice. Finally tonight, after a very tiring day at work I got to try out the toucharcade site once more. I failed first time as I wasn't allowed html to format my post and this confused me. Still I now know that the site is really well setup with scripted tags to make the posting job so much easier. This is a very popular and busy site that offers a lot. Check out the post. And along with my Facebook page that is all I have managed to get done so far. More tomorrow I hope. Finally it is time for me to release my first Distilled gameplay game. The first one in my series of 3 games. I hope you will download it and enjoy its simplicity and openly accessible gameplay. Currently only available for the iOS devices. Here is the Link in the iTunes store. and Here is the Silly Promotional Video. Hope you have fun and get to own your friends on the GameCenter leaderboards. This is the games Logo. I think it looks pretty spiffy and it was created by my mate Paul. Nice one mate. This also allowed us to theme the game in a blue color, which I think was even cooler when I themed Heroic Patterns in Red. This one was created by me mate Sean. He is a talented artist and it was good fun working with him on creating the look for the second Distilled gameplay game. I am still expecting to launch Heroic Buttons tomorrow night. So be ready, i'll be tweeting and Facebooking (is it called that?). I really want a whole lot of downloads if at all possible. The kids go back to school this week, and that I am hoping will be my catalyst to getting Heroic Buttons published. I have been working on getting Heroic Patterns ready for Apple to give the once over and I think it is ready. I should get my Mac out I suppose and upload my latest Binary.. still no hurry, as I want to put out Heroic Buttons and have that out for at the very least 2 weeks before the new game is released. Still, having that already passed by Apples inspectors is no bad thing. My plan now is to go over all my accumulated screenshots and copy and see if there is something else I should add. But in all honesty I think I am ready. Wait though.. I just realized that I have no advertisement for the other Heroic games. Such as Heroic Patterns. Hmm, what should I do? Not like I have the publishing info already for Heroic Patterns. 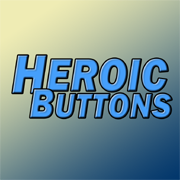 So I reckon there will simply have to be a Heroic Buttons update when I go live with the Heroic Patterns game.